Happy Holidays, Merry Christmas, Happy New Year!!! This year has been amazing to me. I owe a lot of it to my readers. Thank you. Invited to speak at a few conferences. I have had new PiMAME stickers made up. 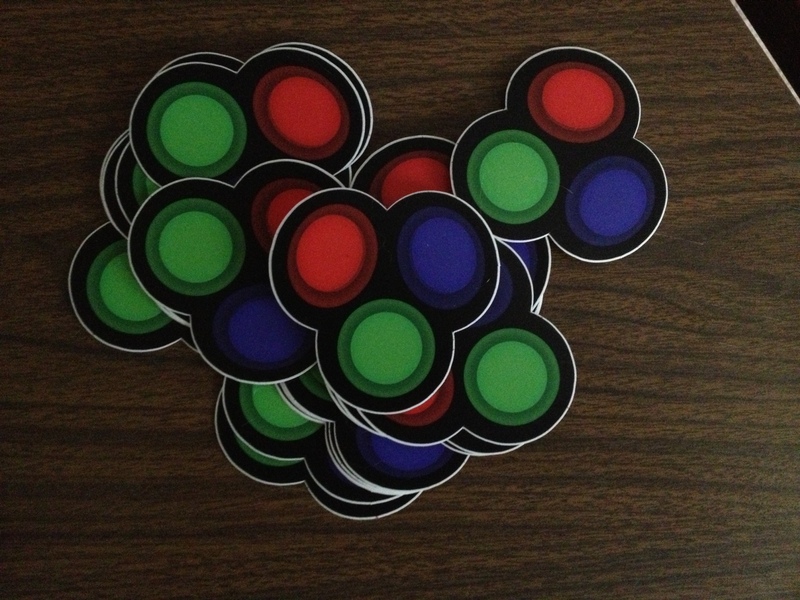 If you would like one, send your address to me using the contact form and I will ship one out! Thanks everyone! Here is to a wonderful 2014!!!! A bunch of my coworkers and I have been looking into crypto currencies for fun. Between figuring out who can get the most hashes per second, watching the markets, and just looking through the source code of the clients, it’s been fun looking at it during out downtime. One of the hardest things to get past is all the terminology and software that you need to setup in order to actually USE a crypto currency. 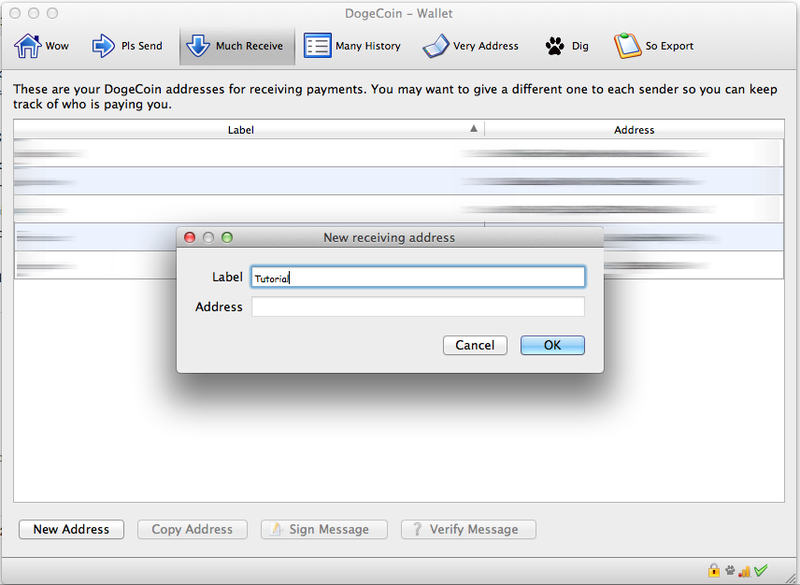 This post is an attempt to make a tutorial on how to use Dogecoin, which is a fork of the Litecoin project, itself a fork of the bitcoin project. Litecoin – A new crypto currency that uses the scrypt algorithm. Able to mine using cpus and videocards. 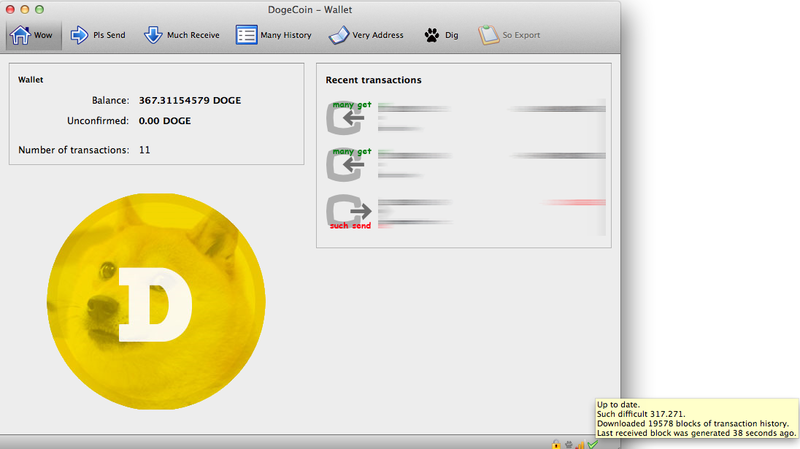 Dogecoin – Such coin! Much wow! An alt coin that is a fork of litecoin and based on the shibu inu doge meme. A fun crypto currency, easy to mine and learn with. SHA256 – The algorithm used by bitcoin. CPUs and GPU based hashing have been replaced by specialized hardware dedicated to this algorithm. scrypt – the algorithm used by altcoins (litecoin, dogecoin). 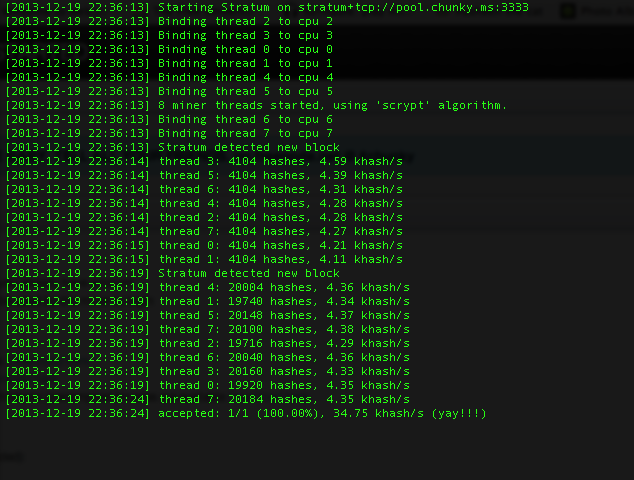 Scrypt is designed to be mined only with cpus and gpus. Dedicated hardware is said to be “impossible” due to the way it’s designed. wallet – a program or website that has unique address and is connected to the blockchain. minerd – a program used to cpu mine. cgminer – a program used to gpu mine with ATI cards (previous versions only) or dedicated hardware (for bitcoin). cudaminer – A program to gpu mine with nVidia cards. pool – a group of individuals all mining together to pool together resources and share in the mined coins. block chain – a list of all transactions. every wallet syncs up to each other and keeps a log of all transactions. 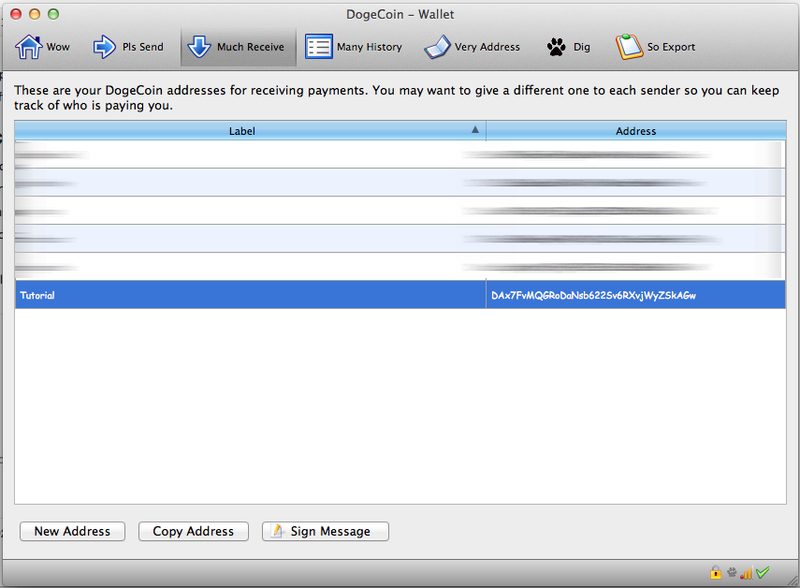 when you send coins to an address, every wallet syncs up, and the wallet with the correct address receives the coins. depending on the coin, it could take minutes to days to sync up 100%. workers – a name associated with your account that you use to mine with. You make a worker for each computer you will be mining with. for example, my username is shea. I have 2 workers, one for each computer. worker one is named red, worker two is named green. You will have zero dogecoins when you start. And you will not by synced to the blockchain. It will probably take a few hours before the checkmark on the right hand side appears. You can hover over it to see how much syncing you have left. 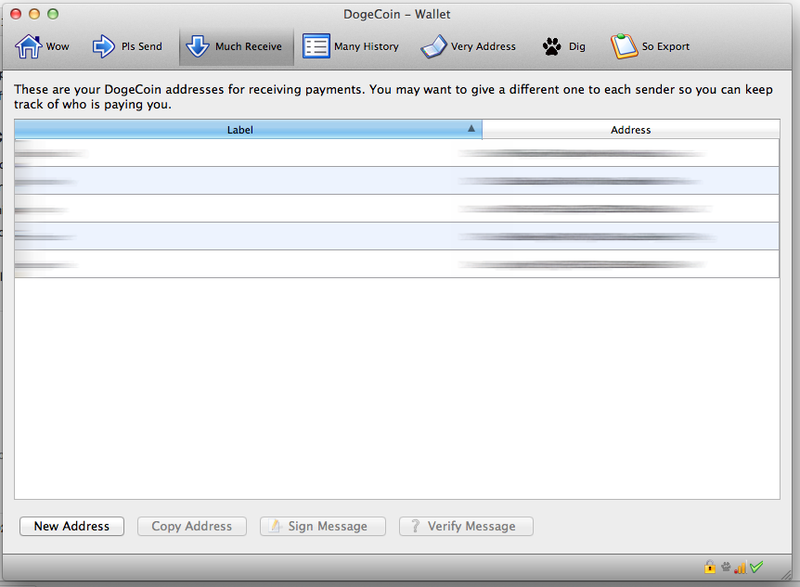 You don’t need to be synced to mine though or to generate addresses to send and receive coins from. Click on Much Receive to find your current wallet address. Click on New Address, and give it a label. 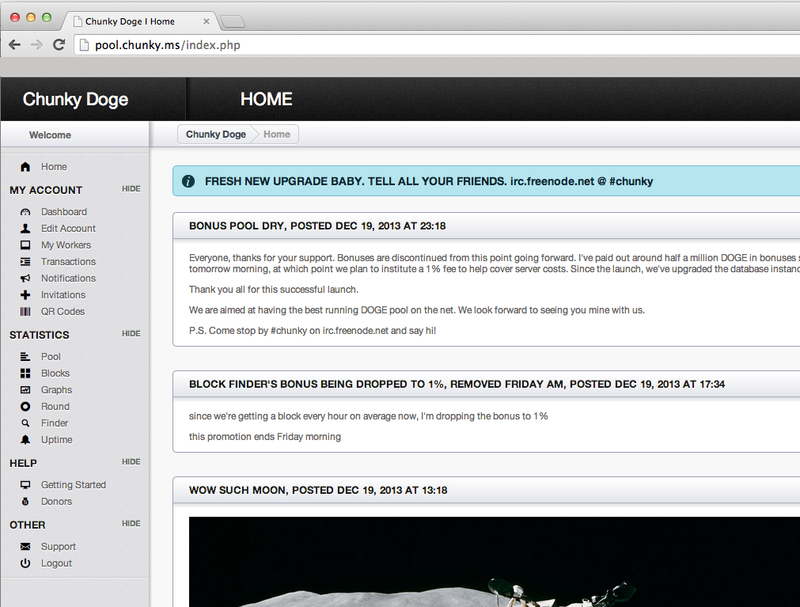 You will then get a newly generated address to receive coins with. You are going to want to join a pool. You will be pooling your resources with a group of others to share the difficulty in mining, and you will receive an amount of coins proportionate to the mining power you put in. 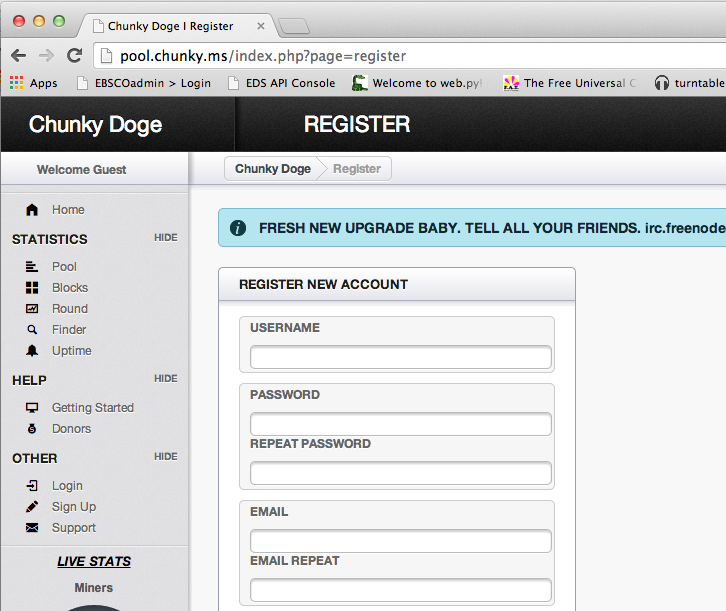 Most pool websites look the same, since the run the same open source software. Find one you like with a fast server and a quick loading website. It may take you two or three tries before you find a good pool. Look for the Signup link on the left, and then fill out the form. When you finish registering and then login, you will see a dashboard like below. Your hashrate should be at 0, because you haven’t started mining yet. Click on the My Workers link. This is where you will add workers. You generally want one worker per machine or program that is mining. 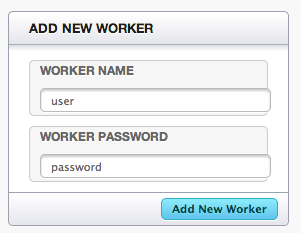 Once you fill out the form with a worker name and worker password, it should appear on the page. Now click on the Getting Started link to get the mining address for your pool. I’m only going to be going over CPU mining, because I don’t have a powerful video card, but the process is the same. I will be using minerd, a part of pooler’s mining suite. 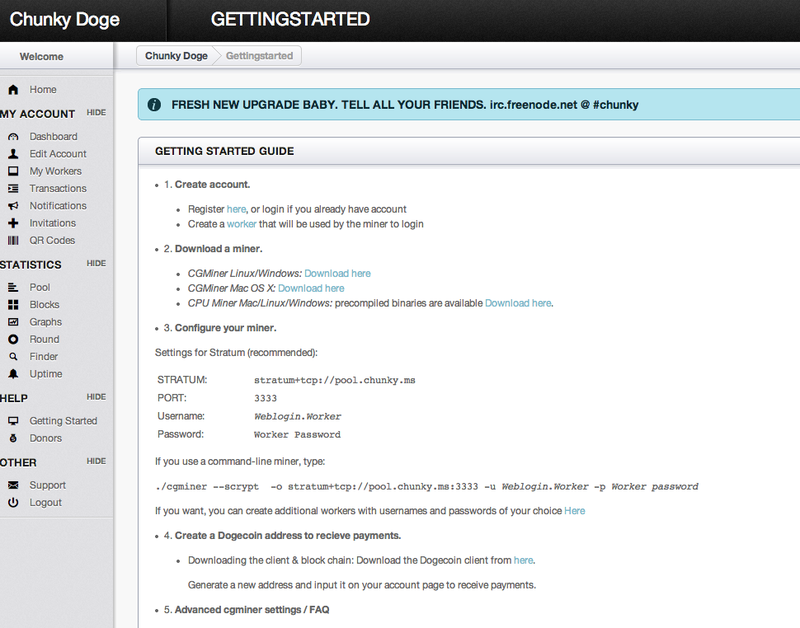 You can download it at the links in the Getting Started section of the pool website. changing the stratum+tcp address to be the one offered by your pool, and your username and worker name+password. 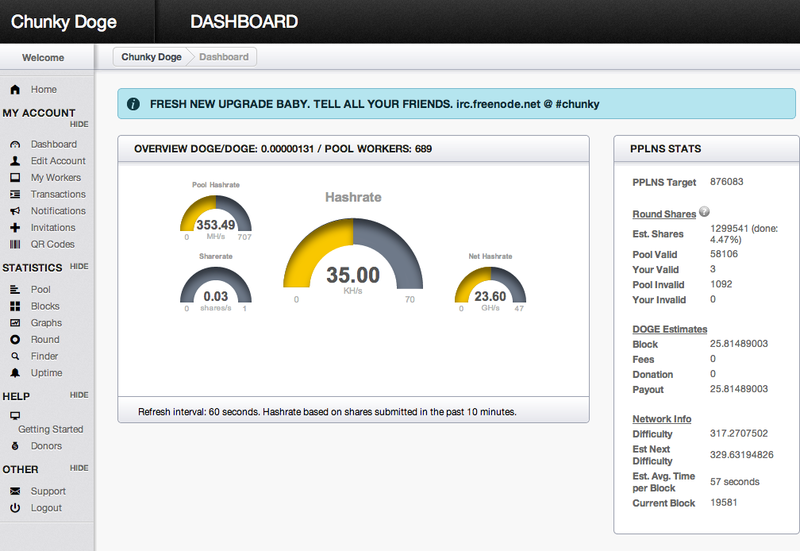 After a while, you should see dogecoins in your pool account. You will want to cash those out and send them to your wallet. Go back to the pool website, click on My Account, and you will want to put in your wallet address (you may want to make a new address for each pool) into the form. When you are ready, click on the Cash Out button. You should receive your coins in a few minutes. I think that is all there is for now. This should get you started. Enjoy, and please let me know if you have any questions. Happy Friday!! This week marks the end of the semester. Finished my finals and got an A! Pushed a lot of work code to our production servers, and waiting for them to turned on on Sunday. Months of hard work finally coming online. It’s been an exciting week. Been playing around with joysticks and working on some issues. 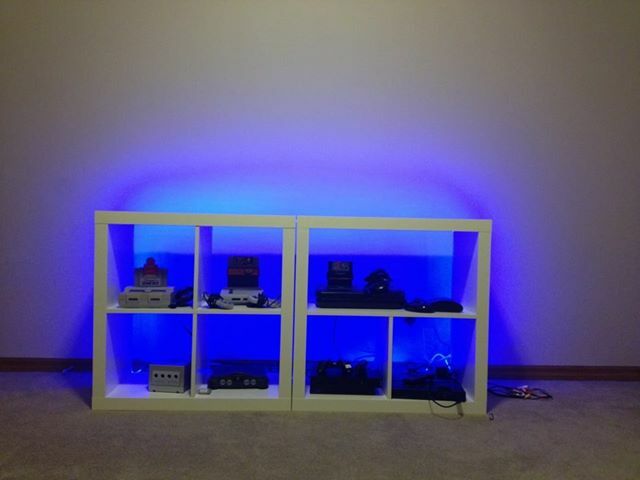 I was also featured on the front page of the Raspberry Pi official site! Cool things on the way! Have a great weekend. There’s a lot of cool PiMAME stuff happening in the forums. Some cool builds and software being developed by other people. Go check it out! I’m going to try and catch up on my sleep, I’m so physically exhausted from house buying and moving! Happy Holidays!